Radiotelemetry is the use of tiny radio transmitters, worn by animals, which emit radio waves that can be detected several hundred meters away. These transmitters help biologists locate and follow shy or cryptic animals. Radio tagging is frequently used by researchers to track animals and gain vital information about their behaviour and survival, over the changing seasons and over the life span. Although many studies have shown that radio transmitters are safe for birds to carry, a recent study found a surprising exception. 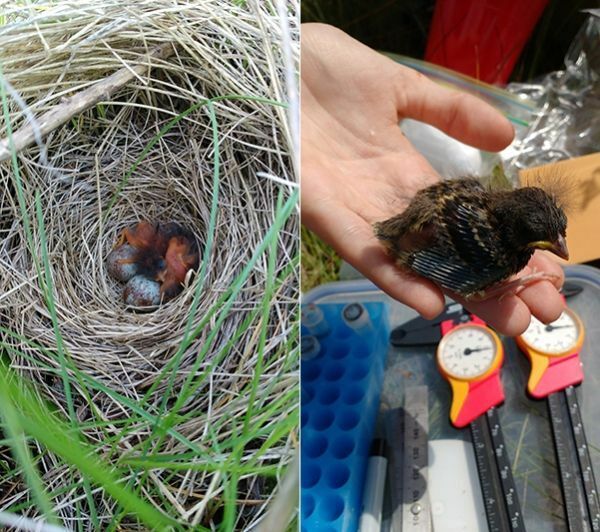 York University Masters Student Heidi van Vliet and Biology Professor Bridget Stutchbury, in the Faculty of Science, began a study on the effects of intensive agriculture on grassland birds, including how this affects the survival of young birds after they leave their parents’ nest. To do this, they launched a study that looked at radio tagged fledglings, or young, Savannah Sparrows (Latin name: Passerculus sandwichensis). “Studying ﬂedgling mortality and dispersal are key to understanding the population dynamics of these birds, and birds in general. Few studies to date have reported any negative impacts on ﬂedglings wearing radio transmitters, but the research community would beneﬁt from this new information,” van Vliet explains. “It could lead to improved methods for new research and to harm fewer individuals in the future,” she adds. Continue reading at York University.